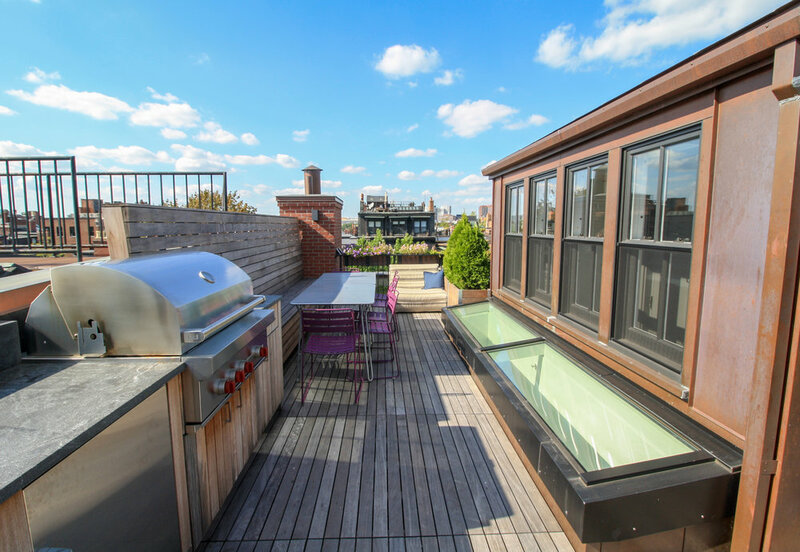 EXTENSIVE GREEN ROOF AND ROOFTOP KITCHEN This multi-use rooftop overlooking the Prudential Center in the heart of Boston’s Back Bay neighborhood maximizes the homeowner’s living space with an outdoor kitchen, roof deck, and two extensive green roofs. Recover installed 375 square feet of FSC-certified ipe deck tiles with copper edging and a custom built bench in the dining area to create a flexible space for entertaining. In the summer kitchen, Recover installed stainless cabinetry, FSC-certified ipe cladding, and numerous other custom finish details. On the north and south edges, the roof deck is framed by two lightweight sedum extensive green roofs integrated with smart drip irrigation, adding color and pollinator habitat to the panoramic skyline.